Well, well, it’s been quite a while since I’ve posted anything of worth, hasn’t it? ^^; I aim to change that starting tonight with a new figure [review]! This time I’m branching off a bit from my usual figure-collecting behavior. 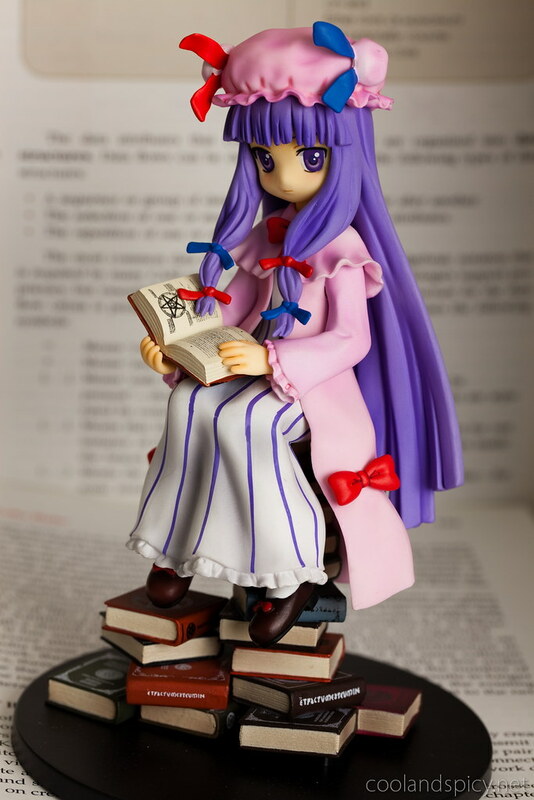 Normally I collect figures of characters I know quite well from an anime, manga, or game, but this time it’s of a character I know only fleetingly ^^; As you probably realized from the title image, it’s Patchouli Knowledge from the Touhou Project. 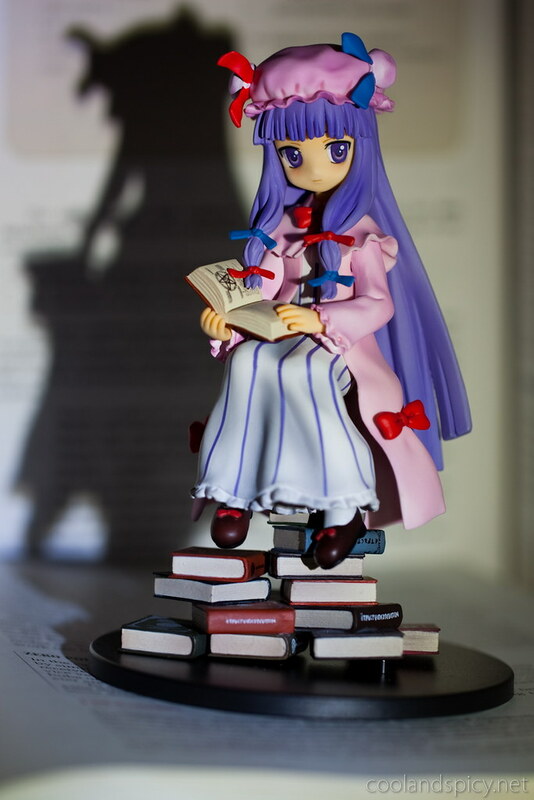 So why did I choose this Touhou figure out of the ever-increasing onslaught of Touhou figures available these days? I decided to experiment a bit with lighting here. I took my small LED flashlight and used it as the sole light source for these photos. In order to get the directed light, I made a rudimentary snoot for the flashlight out of foam board. Seemed to work well enough ^^; For the background, I used a couple of my college textbooks. 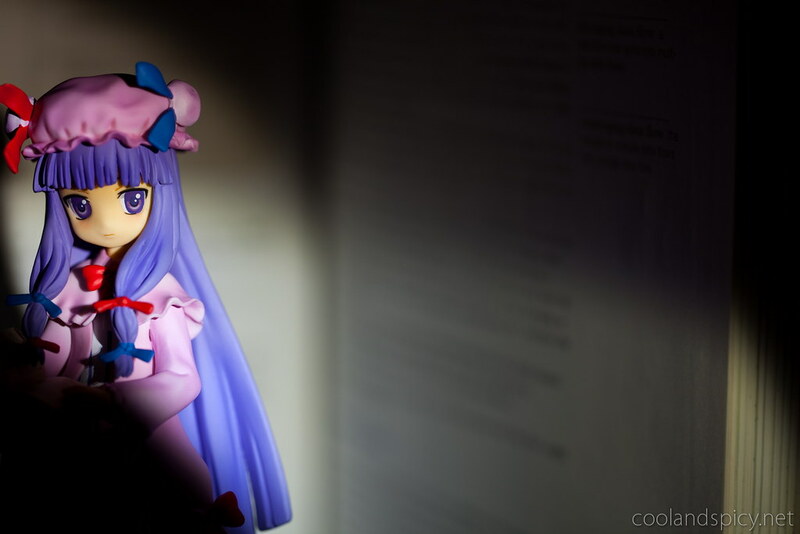 I got a bit carried away with playing with the light and forgot to get photos from other angles. Oops! >_< I think this is the best shot of the bunch. So how about the figure itself? It’s labeled non-scale but is probably about 1/8 scale. It is manufactured by a company named ques Q. I’ve not heard of this prior to this figure but the build quality of this figure is really pretty decent. Not up to Alter standards, but definitely better than others (like some of my Clayz figures…). Patchii’s hair is a tad clumpy and her hair ribbons could have been more detailed. The stripes on her dress are a bit sloppy in some areas too. Still, not bad overall ^^b The books-as-a-base idea is also nice. I should have just ditched the black circular base for these photos (oh well…). 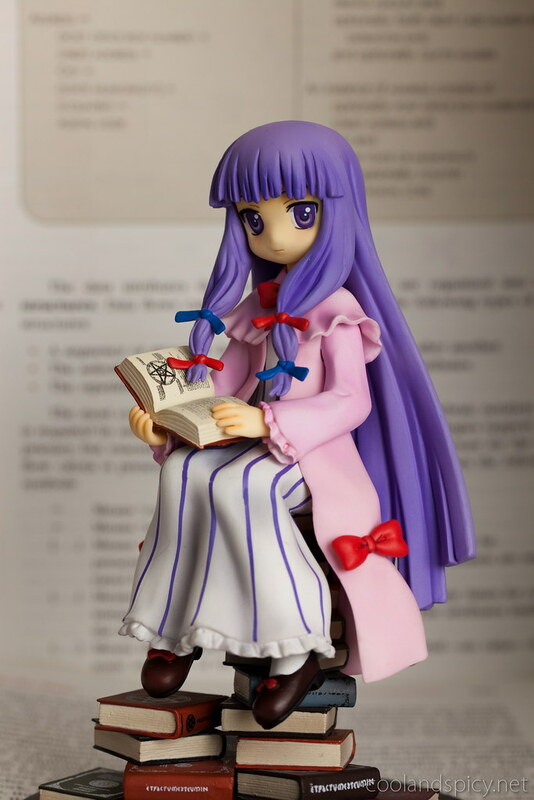 Speaking of books, the book she is holding is removable but she looks kind of silly without it. It’s also nicely detailed as you can see in the photo below. Anyway, thanks for looking! I’m going to try very hard to stop being busy [read lazy] and post more often than once a month. I have a pretty healthy stack of new figures to go through in the next couple weeks ^^. The details on this figure is amazing. All the books and Patchouli are so beautifully made. This is just adorable, especially when she loses her hat. .-= Yi´s last post… Sleeping on Tatami =-. She looks very VERY cute i must say. .-= Fabrice´s last post… figma Yui Hirasawa: School Uniform ver. =-. Cutest Touhou figure so far (in my opinion)! 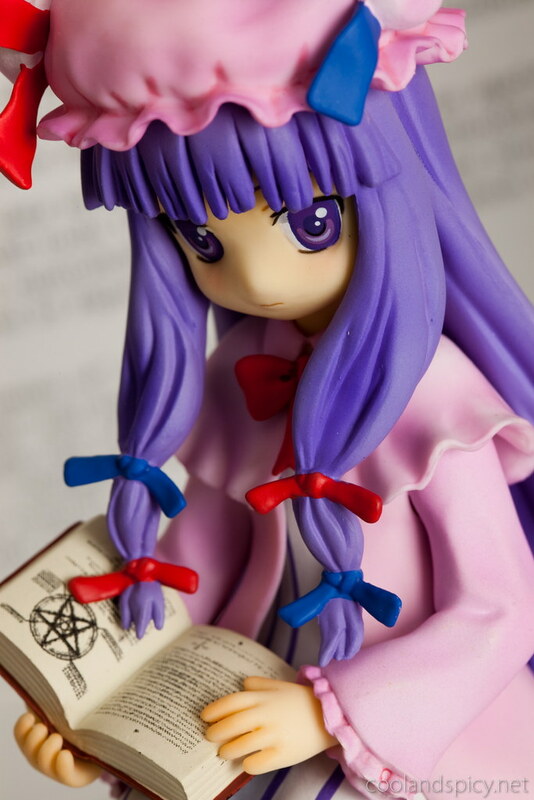 I love the details on her books, not all figures have such intricate detail on minor objects. But I guess this is to make up for some of the other details being a bit flat. Also, shame on you! You should at least play one touhou game! ninjovee´s last post… ~Distant Avalon~ Trial shoot: I still have much to learn. + eBay Halp? Hmmm, yeah, maybe I should at least try the Touhou games. I’m afraid I might not like them though. Worth a try though! The only game I’ve really played was Imperishable Night, the 8th game in the series if I’m not mistaken. I really loved how challenging it was, not to mention trying to avoid all the bullets is just CRAZY. Oh Picture named Pachii3 is awesome. At some point I ordered all of these Griffon figures, but Zun had to recall a majority of them and leave me Touhouless. Blarg. 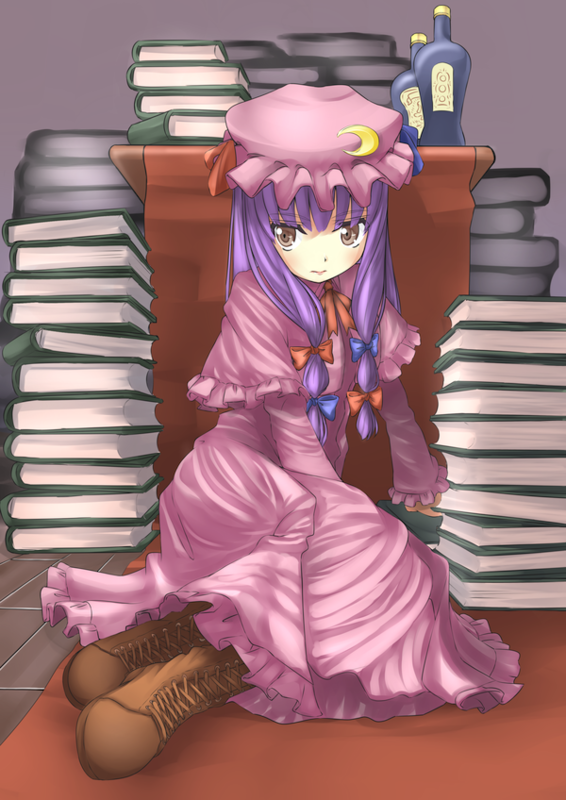 Patchy’s not exactly my favorite, but when it comes to Touhou, especially the Koumakan, I’m fine with anybody. The fact that you had the hat on backwards bites me a little, but I won’t tell anybody :3. GJ on the background as well, right on the theme. 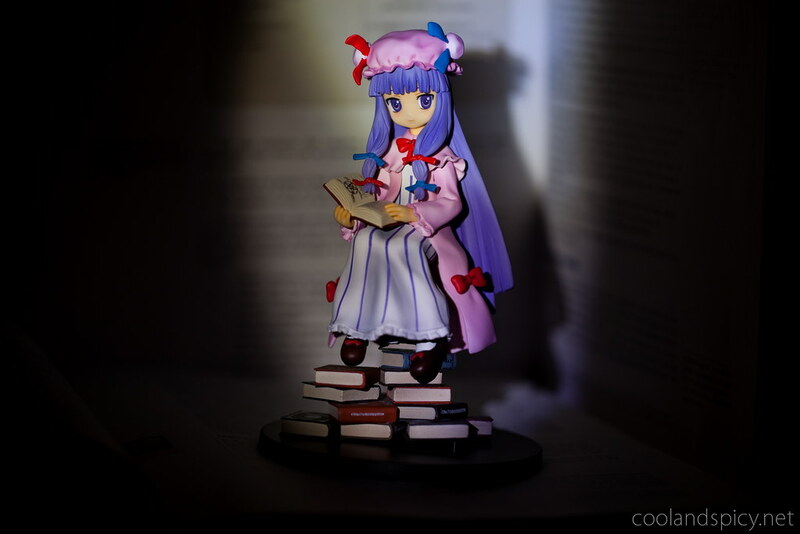 I really do like a lot of the Touhou figures even though I’ve never played the games. But the fact that they’re limited seriously influences whether or not I order one. For now I’ve just made myself happy looking at other people’s reviews of the figures.